The process of growth and modernization in Brazil has been always described as an example to be followed by other developing countries. Nevertheless, the Brazilian ‘locomotive’ has stopped. The country is going through a period of dramatic political and economic instability. Although the Olympics Games should have been an international show of Brazilian power, they revealed the structural weakness of a country full of ambiguities and contradictions instead. The Petrobras’ inquiry, combined with negative effects of the economic crisis, seem to have temporarily buried the China of South America. Oil wealth has become not a blessing, but a curse. To describe the history of the nation we need to focus our attention on oil, because the black gold is the embodiment of the success -and fall- of the Brazilian economy. One the central drivers of Brazilian economic growth has been the production and the export of natural resources and their products. Looking at Brazil’s GDP between 1982 and 2015, three main trends can be observed. (i) A stable growth pattern from 1982 to 2002. (ii) The GDP rocketing up between 2003 and 2012, with a light slowdown during 2009-2010 caused by the financial crisis. (iii) A fall of GDP’s values between 2012 and 2015. 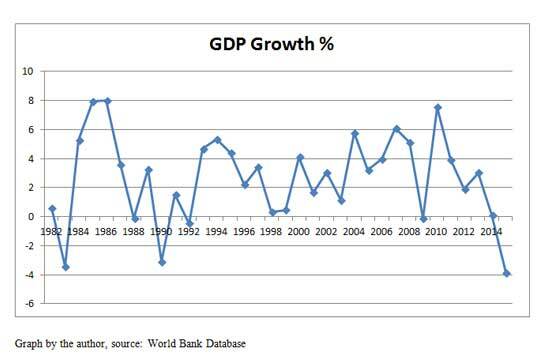 Analyzing the evolution of the percentage of annual GDP growth, it is not possible to identify a specific trend. The most significant point that can be made is the constant growth of the GDP between 2004 and 2008, which was around 5% per year. The economic growth does not just imply a dramatic increase of GDP but also the improvement in social-economic status of millions of poor Brazilians. Starting from 2001 the level of absolute poverty – defined as the percentage living with less than two dollars per day – decreased 12%. The levels of relative poverty – defined as the percentage of people with less than 50% of the average income – fell by 25% between 2002 and 2013. The value of export and of the satellite activities of natural resources for Brazilian is represented by their proportion on the total GDP. 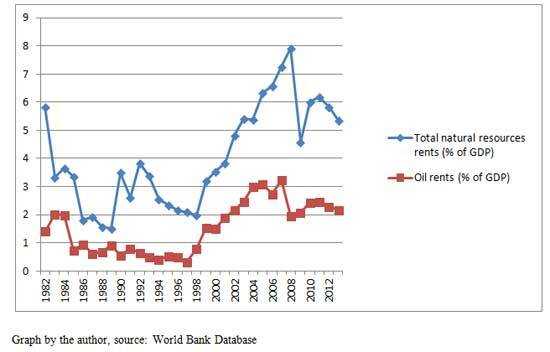 As clearly shown in Graph 4, one of the engines of the Brazilian boom in the 2000s has been oil. 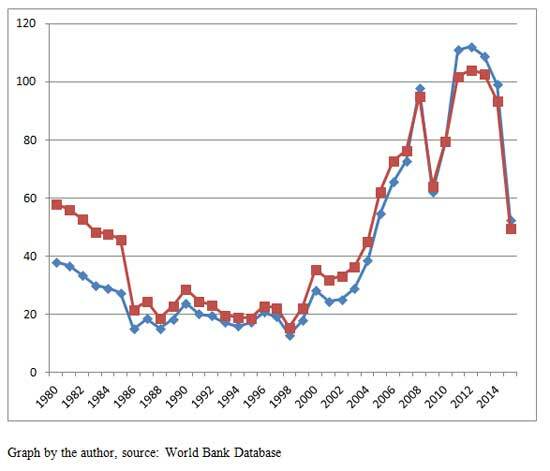 Its incidence on GDP increased remarkably from 1999, a stable growth that reached its peak during 2000s. 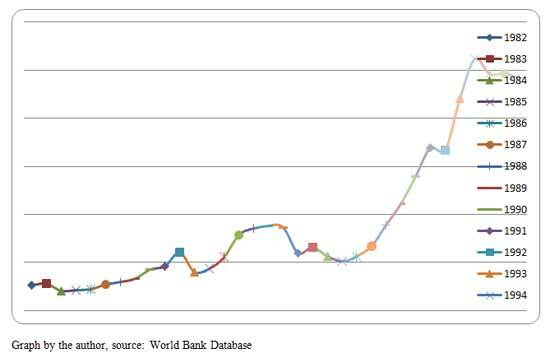 Between 2003 and 2006 oil rents produced around 3% of total GDP. Graph 5 shows the cost of oil per barrel from 1980 to 2015. To clarify, the most important oil reserve in Brazil is Pré-Sal, which needs to compete in a market in which the price is of at least 70 dollars per barrel in order to be profitable. The fall of the international price of oil, then, has been penalizing the Brazilian economy that was already damaged by the crisis of Chinese demand and the slowdown of FDI. The story of Eike Batista is bond with the growth and the fall of Brazilian economy. Batista has been one of the richest man in the world, 8th in the Forbes rank of worldwide billionaires and owner of 30 billion dollars in 2012. However, this changed in 2014 when he admitted to the loss of his wealth and his debt of one billion dollars. How is it possible that this self-made billionaire lost his wealth totaling a whopping 30 billion dollars? The success and the fall of Batista’s business is connected to oil. In the 80s, after completing his metallurgic studies, he went to Amazon forest to implement machines in the research and the extraction of gold. In the 1983 he bought a small society in the Canadian stock exchange, of extraction and trade of natural resources, that gained the value of 1.7 billion dollars in a few years. In 2002 he sold his company for 875 million. The devaluation of the asset was due to wrong investment done by the society in Greece, Russia and Czech Republic, which cost million of loss. Batista exploited new opportunities that arose during the Brazilian economic boom. Between 2001 and 2002 he created and subsequently sold two companies to the Brazilian state; a thermodynamics and an iron production company. The holding that would make a Batista billionaire was OGX (Petròleo e Gàs Participacoes), specialized in the research and refinement of oil and gas. The market strategy of OGX was aggressive from the beginning. In 2007 he arranged the rights of exploration for 21 areas for OGX doubling the amount offered by its competitors. The next year OGX was able to produce barrels at the cost of 145 dollars per barrel and it announced their structures would be able to produce 1 million barrel per day in 2019. Batista’s ambitions and his confidence in Brazilian economy encouraged him to invest a large amount of money to build up a harbour at Acu, 400 km away from Rio de Janeiro. The project was supposed to create a centre for the refinement and the trade of oil products, thereby radically increasing OGX’ productivity. From 2008 onward, the Brazilian magistrate started to investigate bribes that Batista allegedly gave to the Governor of Amapà, Waldex Gòez, concessions of privileges for his companies. Even though the media caught wind of the investigation, the judiciary case was closed without any charges. The slowdown of Brazilian economy and the fall of the oil barrel started to strain foreign investors and foreign shareholders and lead them to reduce investments into Batista’s companies. The final blow was caused by the Abu Dhabi fund, Mudabala Development, which retired from EBX – one of Batista’s holdings – and asked for the liquidation of all their stock options which totaled 1.5 billion dollars. The financial pressure then cut the liquidity of Batista’s companies, which, having invested a lot of money, survived using financial leverage. Like a balloon, EBX snapped under the weight of financial debts that made Batista lose all of his assets. In March 2014, a group of Brazilian judges started to investigate the relationship between the Worker’s Party and the public oil company Petrobras. The charge was that executive directors of Petrobras and of the main building societies (Btp) developed a corrupt system in which Btp would receive contracts for the construction of oil platforms increasing the building costs between 1% and 3%. In exchange, governmental parties would obtain illegal funds to sponsor political campaigns. The companies involved were Camargo Corrêa, Oas, Utc-Constram, Odebrecht, Mendes Júnior, Engevix, Queiroz Galvão, Iesa Óleo & Gás e Galvão Engenharia and members of the Workers’ Party, the Brazilian Democratic Movement Party (Pmdb) and the Progressive Party. (Pp). The main consequence of the inquiry was the delegitimization of the Workers’ Party that led Brazil from 2002 onward. The President, Dilma Rousseff was forced to leave office despite the fact she was not personally involved in the investigation. The successor of former President Lula endured immediate pressure to resign for her knowledge of systematic corruption as Chairman of Petrobras and Minister of Energy (2003-2005). Nevertheless, the impeachment of Rousseff regarded the charge of having transferred public funds from national banks to finance social expenses that went beyond the fixed amount allocated for public expenses. However, the charges that led to her dismissal did not include the Petrobas scandal. Eduardo Cunha was the political leader leading the group that called for Rousseff’s dismissal. Paradoxically, he was not only found with a secret million dollar bank account in Switzerland, but was also barred from assuming any public position for eight years due to an investigation for his involvement in corruption and bribes. Some representatives of worldwide left-wing parties talk about a conspiracy to dismiss the Workers’ Party. The Brazilian and international elite allegedly exploited the economic crisis to destroy the consensus of Lula and Rousseff’s party, which had always had significant popular support. Lula won the election in 2002 with 46.4% of the votes against just 23.3% of his opposing candidate José Serra. In 2006, Lula was confirmed President with 48.6% in the next election. His successor, Dilma Rousseff, won in 2010 with 46.9% of the votes. Even though she experienced a small decline, Rousseff won the election in 2014 with 41.6% of the votes. These Brazilian governments made enemies in the international market due to their politics of nationalization and semi-nationalization of natural resources. For example, Petrobras, founded in 1953, was partially privatized during the 90s. However, Lula started a propagandist campaign in 2007 to return company under state control. In addition, to prevent the private exploitation of the Pré-Sal oil reserve, Lula’s government passed a law to give to Petrobras the monopoly to explore the area and extract oil from Pré-Sal. Some influential voices, such as independent Brazilian experts and academics raised concerns about the nature of the process. Pedro Fassoni Arruda argues that there were secret powers behind the impeachment that were also involved in the coup d’etat in 1964. In a similar vein, Pablo Ortellado criticized the framing of Rousseff in the media. Sapelli contends that the modern political history of Brazil is characterized by a deep fragmentation of parties, which means every President has to deal with many small personal parties. The external support that every government needs to administrate generated the construction of a system of corruption intrinsic to Brazilian society. Many experts believe that judge’s actions could enforce the trust of markets and investors in Brazilian institutions. Cutting the ambiguous bonds that exist between parties and companies should help to make the legal framework more stable and safe, strengthening the power of the Law. This could be a message from Brazil to all the world, that whoever is corrupted, no matter what status, will be punished. Recently, the news reported the Brazilian parliament approved a law with 292 in 393 to abolish the monopoly of Petrobras on the reserve of Pré-Sal. This law seems to be just the first step of a greater project of privatization pursued by President Michel Temer. With strong politics of liberalization for Brazilian natural resources, Brazil seems to offer intriguing opportunities for business and investments for many multinationals. If Petrobras’ inquiry is just conspiracy or smart intuition is hard to understand. Surely, the destiny of Brazil will be, another time, defined by black gold. For better or worse.